Colonies on potato dextrose agar at 25°C grow slowly and are initially white, becoming buff at maturity. Colonies are powdery to granular. Hyphae are septate and hyaline. Conidiophores may occur singly or be penicillate. Annellides are approximately 10-50 x 3.5-6.0 µm, cylindrical, and display a long annellated zone up to 4.0µm wide. 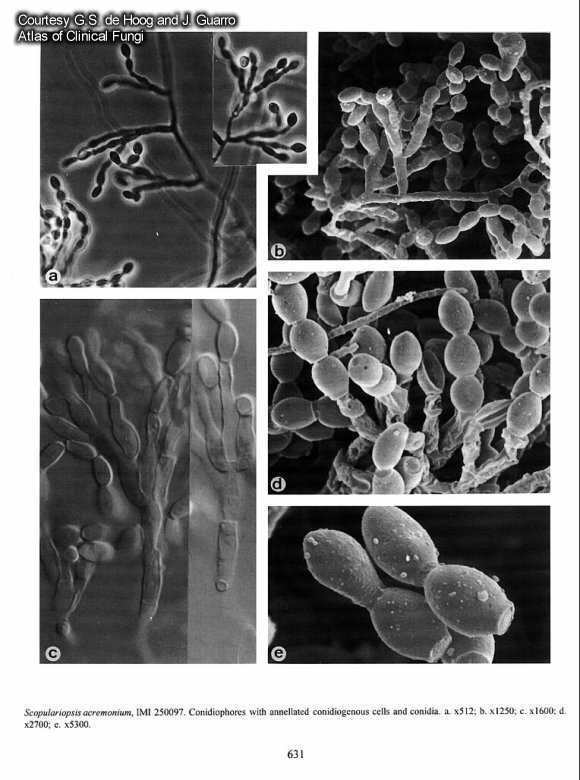 Conidia are hyaline, occur in chains, truncate, measure 8-14 x 5-6 µm, and are ovoidal , . They are distinguished from most other hyaline species by have a pointed apex. Scopulariopsis acremonium has been reported as an agent of invasive sinusitis in a leukemic patient .